Fat Fuzz ZIMcard is a new take on the vintage Dallas Arbiter circuit. It's a stable circuit that delivers the same fat attack and organic sustain of the classic Fuzz Face. Finally you can have a Fuzz that truly cuts through. Apply a Voice to Fat Fuzz and your Jimi leads will never be buried again. It includes a light overdrive stage which smooths out the sound. You won't get that "ice pick" sound that can happen when using a Fuzz through a clean amp. Circuit description - In order to put a FuzzFace circuit into ZIM, I had to change a couple of things. This is due to the values of the DRIVE and VOLUME controls. 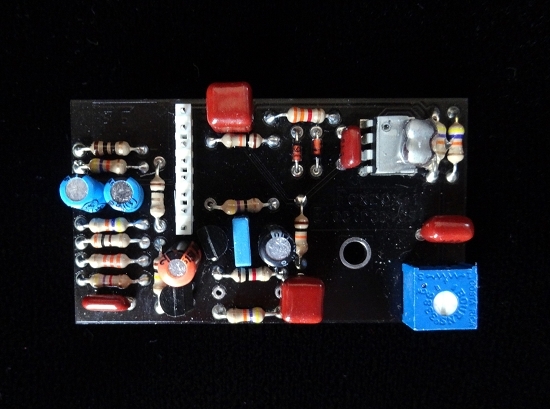 The Fat Fuzz ZIMcard consists of a medium gain Silicon NPN FuzzFace circuit followed by a mild overdrive stage and a tone control. The overdrive stage smooths out the tone and provides additional gain and clipping when the DRIVE knob is turned up. The tone control is on a blue trimmer. On the input side, all the rules that apply to a FuzzFace also apply to the FF ZIMcard. This means that you should avoid putting buffered effects before the Fat Fuzz, it will kill the authentic tone and create a lot of noise. Like a FuzzFace, the Fat Fuzz input wants to see your guitar pickups only. This way you can use your guitar volume knob to get an almost clean sound. Also, most wah pedals will interact just like they do with a FuzzFace - narrow range and oscillation. To learn more about this, look at the Foxrox Wah Retrofit.